Corporations are preparing to increase their spending on Apple products over the next 12 months, a survey of chief information officers has revealed, with companies set to provide more iPhones to employees than in the last four years. Apple has recently come under fire from analysts and media alike after advising it expects to miss its financial projections in its quarterly results, in part due to lower than anticipated iPhone sales. Despite the perceived weakness for iPhone sales, a survey by Piper Jaffray suggests that sales will increase in the next year, at least those by corporate customers. The survey seen by AppleInsider queried 110 chief information officers in 10 different sectors, with the questions concerning devices provided to employees and what mobile platforms were supported. Along with iOS, respondents also provided data relating to other platforms, including Android, Windows, and BlackBerry. When asked what mobile platforms are supported, iOS came out on top with a 50 percent share, ahead of Android's 29 percent and Windows at 19 percent. The results show iOS has maintained its lead for a fifth year in a row, earning a 37 percent share in 2015 rising to 40 percent the following year, then 44 percent in 2017 and 2018. By contrast, Windows has largely occupied the same space at between 22 percent in 2015 and 19 percent in 2019, Android grew from 30 percent to 34 percent until 2018 before dropping to 29 percent in 2019, and BlackBerry declined from 9 percent in 2015 to its current score of 1 percent. For device distribution, more than half of the survey respondents confirmed they intended to provide iOS-based hardware to employees. Approximately 54 percent of the CIOs confirmed iOS distributions for 2019, up from 49 percent in 2018, which is also a higher proportion than the 52 percent recorded in 2017. In the 2019 results, Android is in second place with 28 percent and Windows is in third with 14 percent. BlackBerry again appears with just 1 percent. "Apple's iPhone is the primary BYOD (Bring Your Own Device) choice for their workforce," advised Piper Jaffray, but adds the iPhone is not the only product of interest. "One of the CIOs pointed to an ongoing uptick in spending on tablets for both field and corporate employees, for which they have standardized on iPad." When asked what platforms they wish to increase their investment in over the next 12 months, 54 percent advised they would do so for iOS, followed by Android with 22 percent and Windows with 20 percent. At the same time, 64 percent of the CIOs advised their budgets will increase for 2019, up 2.1 percent from last year. "While AAPL has dealt with recent weakness, primarily for iPhone in China and other emerging markets," note the analysts, "we are seeing positive trends from the company at the enterprise level." Apple has, over the years, positioned itself to be more attractive to enterprise customers, including partnering with firms to create apps for employees and other solutions, including working with Salesforce, IBM, and other partners to increase iOS integration in a business workflow. Companies have noticed that Apple products generate more productivity, have less downtime, and employees enjoy using them more — a mere 30-plus year’s after we told them that is what would happen. Those sizable iOS percentage point increases each year are remarkable. Even though it’s just a survey of intent, it’s a survey of arguably the most knowledgeable cluster of buyers one can find. Growing android support is a worry. The cause no doubt a mix of price and Apple hating IT departments. Warren Buffett’s BNSF railroad just finished switching all their locomotive crews to iPads, and it worked! According to the article Android support falls 5% in 2019, not exactly what I would call "growing." I think Apple can push the longevity of their devices to these businesses as a major selling point. Anytime I've purchased a new Mac or iPhone, I traded in or gave away a fully functional prior model, usually after 3 years (iPhone) or 6 (Mac). Others I know have similar stories. In fact, my dad was talking about his iMac the other month thinking he got it in 2012...no he's been using it pretty much daily since 2009 as he later gloated. I've also heard IT resources to support Macs is less on a one-to-one basis, but have no personal knowledge of this, just what I read. I think you have it backwards — IT department guys are largely Windows admin dudes who were always afraid of Apple products. They still hate Apple and wish to keep their heads in the sand, despite POSIX macOS being better than Windows and proven to have lower TCO (ironically published by IBM), and iOS proven to have a longer supported lifespan. I think you have it backwards — IT department guys are largely Windows admin dudes who were always afraid of Apple products. Maybe you should blame Apple and their lack of tools instead of blaming MS administrators of being "afraid" of Apple devices. 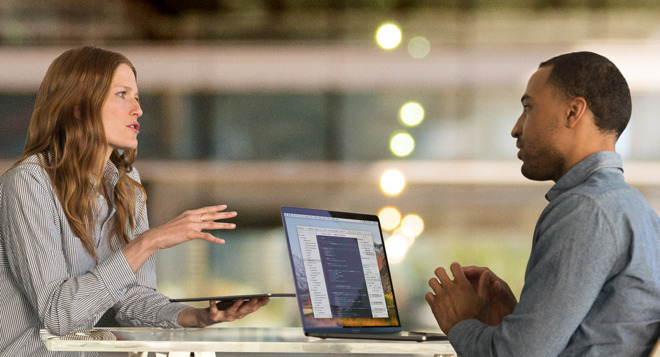 For years MS provide tools (Active Directory, System Center, Intune) to deploy and manage their devices, applications and services, compared to Apple weak management tools. It took a small company, Jamf, to make what Apple never did, offer a reliable way to deploy and manage Apple devices. Even MS had better tools to manage Apple devices than Apple itself. And now Jamf and MS are working together to integrate their tools. Plus the ecosystem MS have for the enterprise in miles ahead of Apple. I could think it's reasonable to understand why MS does better with business / enterprise administrators than Apple. They still hate Apple and wish to keep their heads in the sand, despite POSIX macOS being better than Windows and proven to have lower TCO (ironically published by IBM), and iOS proven to have a longer supported lifespan. Regarding TCO, ironically IBM publish the results at a time the announce the agreement with Apple. I don't think they are lying, but neither I think MS, Oracle or any other company when they claim have a lower TCO than competition. All of them could be saying the truth considering business and enterprises have different needs. macOS is not better than Windows or vice versa. Both have their good and bad things. But Windows integrate far better than Apple in their enterprise business / enterprise ecosystem. Plus MS Office for Windows is much better than the macOS version, and that's one of the most popular application in business, where Apple only have iWorks. The only thing Apple have is mobile, where they are very strong, and most of them are connected to MS services, tools and applications. I don't think administrators hate Apple, as you said. It just that MS did a better job than Apple in the business / enterprise market. No doubt! In my experience, though, it's rather typical for corporate to run a couple decades behind the rest of the world. I always remember when I used to do consulting and some small-to-medium business would want to implement something (say, Lotus Notes) because that's what big XYZ corp uses. And, I'd be thinking... you already have better stuff than that... and it works... and it doesn't take a huge team to manage, etc. Now they're all set to haul that oil via rail, being successful in getting pipelines shutdown. StrangeDays said: entropys said: Growing android support is a worry. The cause no doubt a mix of price and Apple hating IT departments. I think you have it backwards — IT department guys are largely Windows admin dudes who were always afraid of Apple products. They still hate Apple and wish to keep their heads in the sand, despite POSIX macOS being better than Windows and proven to have lower TCO (ironically published by IBM), and iOS proven to have a longer supported lifespan. It's probably a mix of both (fear and hatred), but I don't think they even typically know enough about it to be afraid. Bigoted would be a better term. Regarding TCO, ironically IBM publish the results at a time the announce the agreement with Apple. I don't think they are lying, but neither I think MS, Oracle or any other company when they claim have a lower TCO than competition. All of them could be saying the truth considering business and enterprises have different needs. macOS is not better than Windows or vice versa. Both have their good and bad things. But Windows integrate far better than Apple in their enterprise business / enterprise ecosystem. Plus MS Office for Windows is much better than the macOS version, and that's one of the most popular application in business, where Apple only have iWorks. The only thing Apple have is mobile, where they are very strong, and most of them are connected to MS services, tools and applications. I don't think administrators hate Apple, as you said. It just that MS did a better job than Apple in the business / enterprise market. A few valid points in here, but I think it goes too far overall. Yes, Apple could have certainly done better... directly. But, as you noted, companies like Jamf have been around and others before them. It also depends on when we're talking about... 30 years ago? 25? 20? 10? But, here's the thing. Big IT switched from Novell to Microsoft when Microsoft was clearly inferior, so it isn't like the decision making is based on what is superior. Studies were done by Gartner and others long ago when Macs had a huge advantage over PCs and Windows. I'd say the gap has narrowed a lot since then, so now is a worse time to consider switching. Yes, apps everyone has standardized on like Office are an issue, but are they the best, or just what was standardized on? Why? My point is that it is a bit of a chicken and egg issue here. Did Apple not have those tools because the enterprise went elsewhere, or did the enterprise go elsewhere because it couldn't have happened with Apple? I remember in one of my first jobs out of school, all the engineers laughing at the fact that I had a computer with a mouse and toy-GUI. Back in the days of early networking, the Apple networks I worked on were way, way ahead in about every way than the Microsoft based ones, or even the Novell ones besides the WAN where it was deemed Apple protocols were too 'noisy' (which might have been one short-lived actual good points). A few valid points in here, but I think it goes too far overall. The hardware support issue you mention was critical too. HP, Dell and IBM did an excellent job offering onsite support. I agree that Novell had many things over Windows, but I think that what made MS succeed was the applications (Active Directory w/ Group Policy, SQL Server, MS Mail Server/ Exchange Server, SNA Server, SMS Server, etc). Novell had some similar tools, but the integration the integration MS offered between their tools and with their desktop client was an advantage. And it's still an advantage today for many business and enterprises. Regarding TCO studies, yes Gartner had Apple ahead, like IBM today. But there is no way that a single study will cover the needs of every business / enterprise. IMO, there are cases where Apple is the best option, while MS is better at others. IMO, Office is the standard because was / is the best suite. WordPerfect was better than Word in many tasks. Lotus / IBM 1-2-3 was better than Excel for years. And Aldus / Adobe Persuasion was better than PowerPoint. But Office was a better package / suite than those separate applications, and the integration between applications was a big advantage. When WordPerfect / Novell and Lotus / IBM start to offer their Suites, MS Office was already ahead. And I tried for years to use WordPerfect Office and Lotus SmartSuite, but always came back to MS Office. As today, MS Office has no competition, in quality or market share, including from Apple. On Apple being behind in the enterprise, we can only speculate on why enterprises went elsewhere. What it's clear is that MS made an ecosystem that no other company have, from desktop, to server to cloud. IMO, that's what made them lead on that market. You forgot to mention the thriving Antivirus ecosystem with your revisionist rewriting of history. Microsoft was, on a whole, the worst thing that could have happened to the computing profession, impeding open standards, suppressing innovation and providing open vectors for cyber attacks on any organization stupid enough to run their software. No one will forget the AV companies that came from MS lack of security at the time. The thing is that those AV companies were part of MS success in business / enterprises. And while Apple had a good alternative in desktops with Mac / Mac OS / OS X, their server solutions were behind the competition. Apple server ecosystem was weak compared to what MS offered. And I think that's the reason those "stupids" organizations went with MS instead of Apple. Maybe if Apple had done a better work with their server line, today we would had a different story. Microsoft was, on a whole, the worst thing that could have happened to the computing profession, impeding open standards, suppressing innovation and providing open vectors for cyber attacks on any organization stupid enough to run their software. MS made a lot of stupid things in the past, like the list you mentioned. But they did a lot of good things, including making desktop a popular device, accessible to millions of users. They made MS Office so good, that still ahead of competition today. Their business / enterprise ecosystem was and is what most companies worldwide depend on. I'll agree that they are not perfect. but neither is Apple. And we cannot denied that they have been a big influence, good and bad, in the computing landscape. The quoting got really messed up there, so I think I've pulled out your points below? Hmm, yeah, I suppose as a suite, mainly because of Excel, and then cross-integration. But, I think there are better word-processors, email clients, database-systems/clients, and Keynote, for example. And, maybe in some really big companies they actually use all the integration stuff? In my experience (limited to one big company, and then consulting for a lot of small to medium ones) I didn't see much of that. It was more about 'what everyone is using' and file-compatibility. It's interesting (somewhat on this topic), as I've started to learn Autodesk Revit. I used to work with 3D solids CAD many years ago, that in many ways was ahead of even where Revit is today, at least in terms of UI and modeling tools. However, the depth of the parametric systems and information/workgroup collaboration is kind of unreal in Revit. So, I totally get that aspect and why one would make tradeoffs of one aspect for another. I'm just saying I didn't see many using these 'deep' features of Office. I also agree that 'application server' is pretty much what did Novell in compared to Microsoft. When companies first started switching to NT servers, the difference was night and day between Novell and Microsoft (in Novell's favor), but the application server thing, on the whole, won the day. ... And while Apple had a good alternative in desktops with Mac / Mac OS / OS X, their server solutions were behind the competition. Apple server ecosystem was weak compared to what MS offered. And I think that's the reason those "stupids" organizations went with MS instead of Apple. Maybe if Apple had done a better work with their server line, today we would had a different story. They had reasons... but I guess my argument would be that many of them weren't necessarily good reasons. And, I also, often, ran into pure ignorance and really bad reasons. Maybe another way to put it was that Microsoft was the easier option, both in terms of integration and politics. Macs could have been done (with some benefits), but that was hard to realize unless one were 'in the know' on that, and would have taken some special consideration and especially, political effort.